The 101,000-square-foot Nancy & G. Timothy Johnson Center at North Park University is expected to be ready in the fall of 2014, and its design will reflect principles of environmental stewardship and energy conservation. A formal groundbreaking ceremony for the 101,000-square-foot Nancy and G. Timothy Johnson Center for Science and Community Life is planned for October 26, 2012. Building site preparation will begin this summer, and construction is expected to be completed in time for the 2014 fall semester. The Johnson Center will support a number of the University’s signature academic programs in science and the health professions, as well as offices for University Ministries, International Student Services, Career Development and Internships, and residence life, said Dr. David L. Parkyn, University president. Strong programs will grow stronger, and effective student learning will be advanced to yet a higher level, he said. The Johnson Center resulted from the University’s comprehensive fundraising effort, Campaign North Park. The $57 million campaign is raising funds for the new building, the University’s Annual Fund, student scholarships, and Chicago-based academic programs and faculty development. Fundraising continues. The new building will be named for Nancy and G. Timothy Johnson, recognizing and honoring their lives of exemplary service. Dr. G. Timothy Johnson graduated from North Park College (now University) in 1956, and earned a seminary degree at North Park Theological Seminary in 1963. After completing a medical degree, he served as chief medical editor for ABC News from 1984–2010. Johnson became one of America’s best-known physicians, providing award-winning on-air medical analysis on Good Morning America, World News Tonight, Nightline, and 20/20. He was honored with the University’s Distinguished Alumnus Award in 1991, is the founding editor of the Harvard Health Letter, and the author of several books on medicine and faith. He is also an ordained pastor of the Evangelical Covenant Church (ECC), the church denomination with which the University is affiliated. He chaired a task force in 1979–1980 that recommended the University remain in its historic location on the North Side of Chicago. Nancy Johnson was trained as a nurse at the Swedish Covenant Hospital School of Nursing, Chicago, including study in the sciences at North Park University. Immediately after receiving her nursing credential, she completed a short-term medical assignment in Indonesia. The Johnsons, residing in Marblehead, Mass., have volunteered considerable time to the University through their service on the board of trustees and on behalf of North Park’s two most recent fundraising campaigns, including Campaign North Park. 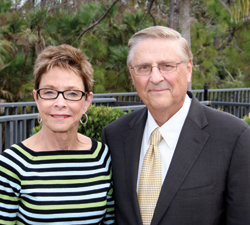 Naming the building for the Johnsons recognizes their service to the University, and as lifelong stewards of its mission and values, said David Helwig, Thousand Oaks, Calif., chair of the University’s board of trustees and a member of the class of 1978. “Tim has tirelessly championed the need for this new facility to prepare North Park’s students for demanding careers in modern science, medicine and nursing. Nancy likewise is deeply committed to this important mission,” he said. The Johnson Center will be located in the heart of the campus, and will be constructed to reflect environmental stewardship and energy conservation. The project will target Gold LEED (Leadership in Energy and Environmental Design) Certification, demonstrating characteristics such as lower operating costs, resource conversation, and healthful and safe working conditions. The center will feature 30 technology-enhanced laboratories, academic facilities, and faculty and staff offices. Student co-curricular services will be housed in the new facility, as will a café, plus conference and meeting spaces. Through the summer months prior to the start of construction, the University will complete the building design with the architectural team, finalize a finance plan, and continue fundraising.